Flor is a certified Lean Six Sigma Master Black Belt, experienced Quality and CI Manager as well as trainer, coach and consultant. Flor has experience in building and implementing continuous improvement strategy in the organization, developing Lean Six Sigma training programs and motivating people to pursue continuous improvement. 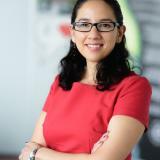 She worked mainly in BPO organizations although she has consulted production companies as well. Currently she is Process and Controls Improvement Manager in HEINEKEN. Check out the incredible speaker line-up to see who will be joining Flor Martinez.